Answer: The sharing of information. 2. What are the two types of Communications? Answer: Interpersonally (between individuals) and through communications systems that transmit messages between large numbers of people. 3. Give an example of ‘hybrid system’? 4. What is the main goal of United State’s Electronic Communications Systems? 5. What was the name of early Mesopotamian writing system? 6. Which was the first writing system? 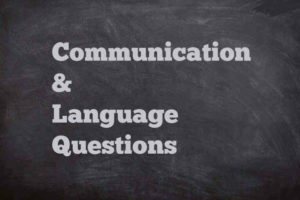 Answer: Using symbols to represent individual speech sounds instead of objects. 8. Write the name of a language in which each character stands for a word or part of a word? 9. About 500 B.C., the ancient Greeks developed a fast method of sending message from city to city. What is the name of that communication system? Answer: Acta Diurna (Daily Events). 11. What was the chief writing material of ancient period? 12. Which religion exerted a powerful influence on communications systems throughout the Middle Ages? 13. Who invented movable type printer in the 1000’s? 14. Who was the inventor of movable type printer in Europe? 15. Which was the first printing press in Europe? 17. The early Greeks wrote on tablets with a pointed tool. What was it called? 18. Who invented the use of the alphabet for writing? 19. Where was the printed news sheets called ‘Corantos’ appeared? Answer: Netherlands, England and other trading nations. 20. Which was considered as the first true newspaper?